Summary and Definition: The Leni Lenape tribe lived along the Delaware River inhabiting New Jersey, eastern Pennsylvania, New York, Connecticut, and Delaware. 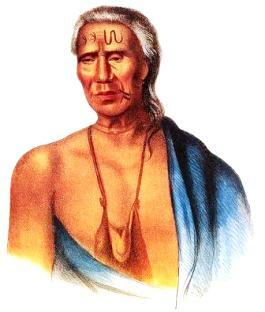 The Leni Lenape came to be called the Delaware tribe, after the river they originally lived along. The tribe were forced to continuously cede their lands and migrate due to the encroachment of white settlers. What was the lifestyle and culture of the Lenape tribe? The Lenape women planted and maintained crops primarily of corn, beans and squash. The men were responsible for hunting and fishing. The Lenape numbered over 20,000 and lived in villages of longhouses containing several hundred people, but in the summer they would build temporary camps consisting of birchbark wigwams (wetu) for purposes of hunting and gathering. Their Lenape tribal lands were encroached by several European nations including the Dutch, French, Swedish and the British and their Native Indian enemies were the Mohawk. Early relationships were friendly and based on strong trading links but with the constant flow of Europeans they became involved in various conflicts which resulted in their migration further and further west. The Lenape fought against the Dutch in Kieft's War (1643–1645) in which they were subjected to the Pavonia Massacre and the Esopus Wars (1659 - 1663). The Leni Lenape tribe then supported the British throughout the long French and Indian Wars (1688-1763). European diseases and constant warfare took a terrible toll on the numbers of Lenape Native Indians and the people became scattered across many present-day states and Wisconsin and Ontario in Canada. The descendants of the Leni Lenape tribe are known today as the Delaware and Munsee Indians and live across many states, with the largest group living near Bartlesville, Oklahoma. What language did the Lenape tribe speak? The Lenape tribe spoke in related dialects of the Algonquian language family, Unami was spoken in the south and Munsee was spoken in the north. The tribe called themselves the 'Leni Lenape' which is derived from the Algonquin words meaning "real men". The colonists and settlers called the people the Delaware tribe reflecting their large settlements along the Delaware River, which was named after Lord de la Ware. The three traditional divisions of the Leni Lenape were the Munsee, Unami, and the Unalactigo who spoke in different dialects and lived in different locations. Where did the Lenape tribe live? The Lenape are people of the Northeast Woodland Native American cultural group. The geography of the region in which they lived dictated the lifestyle and culture of the Lenape tribe. What did the Lenape tribe live in? The Lenape tribe lived in large villages of longhouses in the winter. 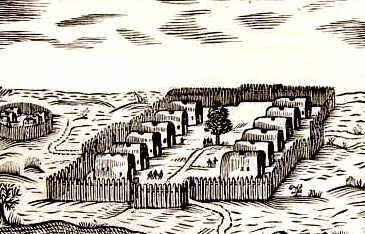 The Munsee villages were heavily fortified with palisades due to attacks by the Mohawks. The Unami and Unalactigo towns were rarely fortified. The Lenape wigwam was built in the summer with wooden frames that were covered with woven mats, sheets of birchbark and animal skins. Ropes were wrapped around the wigwam to hold the birch bark in place. What clothes did the Lenape wear? The Lenape clothes were made from animal skins and included long breechclouts, leggings, long cloaks and shoulder to waist length mantles. These were made from the skins of deer (buckskin) raccoon, otter and beaver. Lenape Women wore wraparound skirts, tunics and cloaks. The Europeans introduced trade cloth to the Lenape tribe who then began to change their traditional style of of dress. Lenape Men removed all facial hair and the men and women often colored their faces with red ocre. Tattooing was also common to both sexes, as were nose rings. Older men wore their hair long, but Lenape warriors usually had a scalp lock decorated with a roach headdress that was often dyed a bright red color. The roach headdress was attached to the scalp-lock and stood straight up from the head like a crest. Sometimes feathers were added as additional decorations. What did the Lenape tribe eat? The food that the Lenape tribe ate included the staple diet of the 'three sisters' crops of corn, beans and squash. Tobacco was also farmed by the men. Fish such as sturgeon, pike and a variety of shellfish such as clams, oysters, lobsters and scallops were an important part of their food supply. The Lenape men also provided meat from deer (venison), black bear and smaller game like squirrel, rabbit, wild turkey and duck. The Lenape food also included nuts, vegetables, mushrooms and fruits (plums, blueberries, strawberries and raspberries). What weapons did the Lenape use? The weapons used by the Lenape warriors included war clubs, tomahawks, battle hammers, bows and arrows, knives, spears and axes. Lenape History: What happened to the Lenape tribe? The following Lenape history timeline details facts, dates and famous landmarks of the people. The Lenape timeline explains what happened to the people of their tribe. 1643: On October 1, 1643, a force of united Native Indian tribes attacked the homesteads at Pavonia, most of which were burned to the ground. 1763: The Lenape in Ohio fought the British in Pontiac’s Rebellion (1763 - 1766) A shaman known as Delaware Prophet played an important role in the conflict. 1845: The population of the Lanape had dropped to less than 2,000 people living in both the United States and Canada.